The white men in sports could learn something from these women. Then there is the New York Liberty. 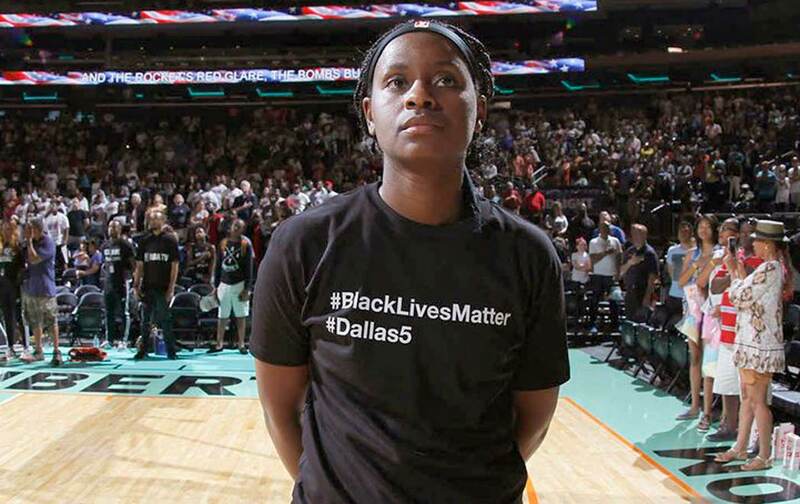 Before their game on Sunday against the San Antonio Stars, the entire team wore T-shirts with the words #Blacklivesmatter and #Dallas5 on the front and a blank hashtag on the back. That blank hashtag was, according to the indispensible WNBA blog Swish Appeal to show the importance of “creating a new hashtag everyday [that] will help continue to spread the word.” But it could also have been a statement that too many black men and women have become, in death, hashtags, and we do not know the name of the next one, only that it is coming and will continue unless something changes. These kinds of stances actually make a difference. They legitimize people’s anger and right to resist at precisely the moment when people in the mainstream media and politics are trying to disrupt and distort a growing movement. They also matter because these are public and visible displays of real solidarity: white players joining with their black teammates,wearing the same shirts and standing alongside them in a show of multiracial unity against anti-black bigotry. The white men in sports could learn something from these women. Stand with your teammates. Take on some of the weight. Give them political cover as the haters and bigots descend upon them. It’s not complicated. If your team really is a family, then you should care about the lives of your sisters and brothers. The Lynx and the Liberty are showing what solidarity looks like. The men need to take a lesson.